This husband and wife originate from northern Louisiana, graduates of Southern University A & M College in Baton Rouge, Louisiana obtaining degrees in Microbiology. They decided New Years Day 2007 to leave their day jobs to heal the world through music. Though this road hasn’t always been easy, sacrificing the house and the car, they have stayed true to the mission to heal those of us that are going through everyday struggles and lessons of life. DNA, (Destroying Negative Attitudes), who’s Spoken Word let you know exactly how it is- straight no sugar coating- but relates and communicates to all ages and races regardless of the situation. Gi-Twice, who defines melodic soul, can do it all, mixing the old big band era with a Gi-Twice twist, you get an unbelievable pure and positive vibrations that really hit deep. The name Mahogany Dust comes from combining the names of Gi-Twice guitar “Mahogany” and DNA’s guitar “Dusty”. Mahogany Dust mission is to change and assist the overview of life and everyday situations through the combination of Spoken word, soul, and acoustic guitars- creating “Spoken Soul”. Mahogany Dust mentors and volunteers to several school, churches and organizations, throughout the Atlanta metro communities. Some schools and organizations include Southside High School, Centerville Elementary, MLK High School, Beyond the Bell, Inc., Diamonds in the Ruff, Roots to Fruits, Rep. Mike Glanton- Clayton County Multicultural Fest, Atlanta’s Earth Day, Habesha, Centerville Elementary and over 100 Beauty and Barbershop across the US. Mahogany Dust has also graced many major stages in Atlanta, Dallas, and Houston, including platforms such as BET-J Lyric Café, MTV’s Made, 102.5 FM Steve Harvey Morning Show, V-103.3 FM Joyce Littel “Poetic Moments Live From Sugarhill”, WRFG 89.3 FM, VI Radio, “Bubba’s pick of the week”, Sweet Auburn Fest, Malcolm X Fest, Organic Fest, Urban Grind Singers/Songwriters, Isa Dream TV, “Women’s Empowerment “ hosted by BET’s Comic View Chocolate’ and many Fashion Shows and Talent showcases. 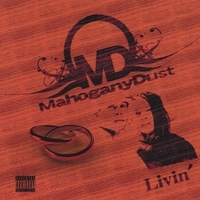 Mahogany Dust is not only a music group but they are also producers, songwriters, promoters, marketers, (making their own commercials) and has sold over 1400 CD’s (Livin’) all without any distribution. Mahogany Dust has invested and manages their own studio (MD Studios & Productions) in which they have produced other local artists in Atlanta. They have put on many productions to include “Soul Glow” (UTM Studios), Acoustics by Candlelight (Urban Grind), Dramatic Soul (Mocha Match), and Kat’s Acoustic Café (Kat’s Café). This group is truly a force to be reckoned with, due to their dedication and independence possessing all the quality’s of true organic artists producing true organic sounds. This CD is unlike any other I've ever heard. There's a familiarity in the music that makes you want to compare it to groups like Kindred and even Floetry, but Mahogany Dust has a uniqueness that is unmatched by anyone that has come before them, and a style that will definitely be appreciated by those that come after. Gi-twice flexes her amazing soprano range and D.N.A's words entertain as well as provoke thought. This is a combination that cannot lose. Track #4 In Love With Me is going to be the 'HIT' to listen/watch for!! !